This major project was the completion of two sections of bridleroute in Shenley parish. Once in place, they complete the eastern side of the Aldenham Parish Ride, and form a good basis for the western side of the proposed Shenley Community Circuit. New Shenley (Porters Park) (section 7) - 7 Aug 09 Now open for use! New Shenley (Porters Park) (section 8) - 7 Aug 09 Now open for use! Legal recording completed. Radlett Lane to Woodhall Lane (section 10) - 9 Dec 16 Now open for use! Legal recording completed. Woodhall Lane to Theobald Street - Legal work completed (Nov 11); physical work completed, paths open and available for use. 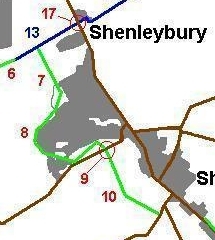 Shenleybury Pegasus Crossing (section 17) - 1 Jul 15 Now open for use! Hertfordshire County Council agreed this project in principle in 2014, and the crossing was constructed and opened in 2015. Or just send a £5 donation by texting PATH00 £5 to 70070. For the development work to the north of this project, look at our Harperbury Major Project. © 2018 Patchetts Green Bridleways Trust.